Content by Tony Macklin. Originally published on March 13, 2011 @ tonymacklin.net. 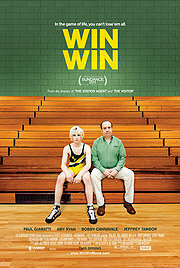 Occasionally a movie succeeds simply on the persevering talent of its star. The Lincoln Lawyer is such a movie. Matthew McConaughey carries The Lincoln Lawyer with sheer credible willpower and personality. McConaughey has to survive fitful direction and a choppy script, but he emerges with his likeable faculties intact. 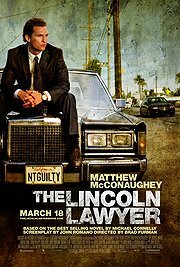 In The Lincoln Lawyer, McConaughey plays Mickey Haller, a Los Angeles lawyer who serves both the rich and bikers. At the beginning Haller is not much concerned with conscience. He is interested in the deal. He has a driver and a smile. But his perspective changes. Louis Roulet (Ryan Phillippe) is accused of attacking and trying to murder a woman and requests the services of Haller. Haller sees a big payday, because Roulet is from a wealthy family. As Haller pursues his defense, he faces his past. He questions a former case in which he wasn't as committed as he should have been. As The Lincoln Lawyer unrolls and he evolves, justice becomes crucial to Haller. Matthew McConaughey has joined the Atticus Finch law firm -- in both A Time to Kill (1996) and The Lincoln Lawyer, his character's conscience prevails. Justice is all. McConaughey's speech -- from a novel by John Grisham -- in the Southern courtroom in A Time to Kill has become a memorable scene in modern film. With The Lincoln Lawyer, almost immediately one knows the direction by Brad Furman is going to be awkward. The opening has a jittery camera; Haller's initial exit from his automobile and his walk down a hall are shaky. Furman -- a Philly guy -- employs in-your-face direction. He seems addicted to close-ups. He also likes pans around a character's head. The script by John Romano from an excellent novel by Michael Connelly is barely serviceable. There are major deletions. Connelly used first person narration -- a forte of many novels -- to tell his tale. 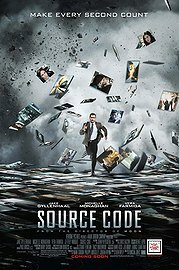 This seems to have become a dated technique for movies. 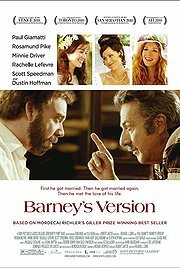 Recently both The Lincoln Lawyer and Barney's Version have junked effective first person narration. It's missed. Narration keeps the character's voice and --perhaps more important -- the author's voice. Most films from literature exile authors and replace them with word plumbers. It makes it easier. But it's clunky. I wish they'd kept Haller's evaluation, comparing himself to bikers: "I was a greasy angel. I was the true road saint." Lines of self-evaluation and wit are missing from the movie. There are changes for more blandness. Raul Levin -- whom in the novel Haller calls "Mish," for a mishmash of Jewish and Mexican descent -- is changed to Frank Levin (William H. Macy). Connelly is not much on description of character, but he's a strong writer of dialogue and suspenseful narration. He creates a depth, texture, and heft the movie simply doesn't have. And Connelly tells a better story. The surprise ending in the movie seems more a trick than it does in the book. It seems almost an afterthought. The name cast is uneven. Marisa Tormei is in a thankless role as Haller's former wife. Maybe her strong scenes were left on the cutting room floor. But William H. Macy shines as Haller's friend and aide. Both Phillippe and Frances Fisher suffice as the wealthy son and mother. Michael Pena is solid as a previous client of Haller who was imprisoned. But The Lincoln Lawyer is basically McConaughey. Although the car and film are driven by other people, ultimately McConaughey's backseat presence is what counts.